Have a question on A5? A5 is available in 19 different colors - Black, Alpine Green, Carrara White, Blazing Red, Ibis White, Silky Silver, Brilliant Black, Glistening Grey, Moonlight Blue Metallic, Daytona Grey, Monsoon Gray Metallic, Scuba Blue Metallic, Floret Silver Metallic, Argus Brown Metallic, Mythos Black, Grey, Purple Fusion, Tango Red Metallic and Matador Red Mica. Watch latest video reviews of Audi A5 to know about its interiors, exteriors, performance, mileage and more. Produced by the popular German car maker, Audi A5 is the series of executive coupe. The all-new A5 coupe gets elegant exteriors, sophisticated aerodynamics, powerful engines and innovative techs. The Audi A5 has been there in the Indian car market since quite some time and recently Audi expanded its foothold with the introduction of second-generation A5 in the subcontinent. The all new Audi A5 is based on the same platform as that of A4 and also available in Sportback body style. The vehicle gets new dimensions while the inner and outer profile receives various updates. The mechanicals remain the same. Audi A5 on the outside looks fantastic and one can’t even afford to ignore it. Audi A5 car is a perfect balance of sportiness, looks and power. Look at the car from whichever angle; it surely demands your attention. The front façade is the place that attracts a lot, it gets wide radiator grille, the front bonnet gets 4 creases on it that further enhance the looks. Headlamps looks aggressive and these LED units have sharp DRL running on the top. Checking out the dimensions, new A5 is 21mm longer, 5mm shorter, 11mm less wide and has 14mm longer wheelbase. On the sides, its 145/40 R18 tyres further add to the amazing looks. At the rear, the bulging wheel arches provides muscular proportions to the car. Dimensionally, the car measures 4733mm in length, 1846mm in width, 1383mm in height while the wheelbase stands at 2765mm. Audi A5 is offered in vibrant shades namely, Moonlight blue metallic, Daytona grey pearl effect, Matador red metallic, Navarra blue metallic, Gotland Green metallic, Floret Silver metallic and Argus Brown metallic. Inside, Audi A5 gets all-black interiors and plush upholstery seats provide classy looks to the cabin. The car gets three-spoke steering wheel, wide centre console and all digital cockpit together making the car feel very special. Instrument cluster is the Audi’s Virtual cockpit that means it has all digital display that shows relevant information like the date, time, tachometer, navigation, odometer, drive modes and fuel consumption details on it. More features in the list are air conditioner, electrically adjustable rear view mirror, auto dim interior rear view mirror, deluxe 3-zone electronic climate control, electric auxiliary heater, push start/stop button, and cruise control among others. The car comes with MMI infotainment system which rests on the dashboard taking care of all the entertainment aspects. The system is coupled to Audi’s Sound System and is compatible to Bluetooth and USB Auxiliary input. In terms of powertrain, Audi A5 is powered by the 2.0L diesel motor that is capable of generating the power output of 190PS and the maximum torque of 400Nm. The motor comes mated to 7-speed dual clutch gearbox. Audi A5 can reach 0-100kmph in mere 7.9 seconds and has the top speed of 235kmph. 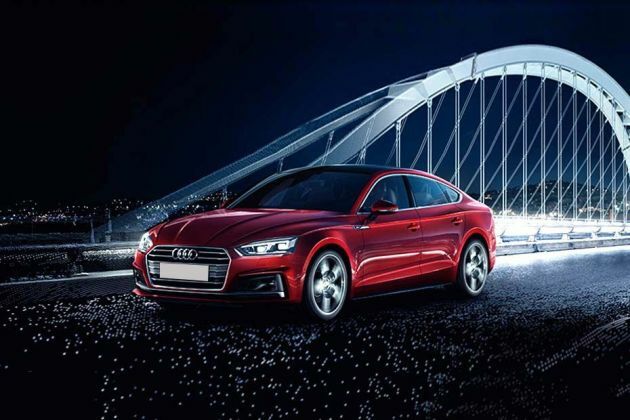 On the safety front, Audi A5 gets features like airbags, anti-lock braking system with electronic brakeforce distribution, electronic stability program, hill assist, brake assist, traction control, cornering lights, rain sensing wipers and automatic headlamps. Audi A5 in India is available in 2 variants they are A5 Sportback and A5 Cabriolet. In terms of pricing, Audi A5 Sportback is tagged at Rs. 55.4 lakh. Talking about the competitors, Audi A5 coupe currently lock horns with rivals such as Mercedes-Benz E-Class, BMW 5-Series and Volvo S60. The moment you open up the frameless doors, it creates a feeling that you are stepping into a special car. Though you have to put yourself down a little to get into the seat, it is not much lower as compared to similar cars in the class. The driver’s and the co-passenger seat which are 8-way electrically adjustable, snug you comfortably, giving you a commanding view of the road while the tilt & telescopic steering allows you get the perfect driving position. The front seats of the car are not deep as you would expect, but does a nice job of holding the passengers tight in place. However, the carmaker hasn’t added memory function in the seats which is quite surprising. That sense of specialness is created by all-black interiors, all-digital cockpit, 3-spoke steering wheel and the wide centre console. In terms of quality, it’s impeccable with the dashboard, centre console and the door pads features open pore black wood which really looks elegant. On the dashboard rests the infotainment display which is unfortunately not a touchscreen unit but does come handy when getting vehicle info, playing media and connecting with the smartphone. And another disappointing aspect of this infotainment is that it isn’t compatible with Android Auto and Apple CarPlay which must have been included in a Rs. 60 lakh car. Audi has tried to keep this car driver-focused as it has provided it’s tried and tested Virtual Cockpit that comprises of sharp graphics and gives relevant vehicle information including navigation, fuel consumption, speed, distance to empty, odometer, tachometer, different driving modes and many other. The centre console features gracefully arranged buttons with rotary selector for controlling MMI and scribble pad for deciphering the commands. There is also a solid gear stick which not only looks nice but also instils confidence in you. Further, talking about the buttons and switches, the one that are there on the air cons are nice and touch-sensitive. However, you have to physically toggle them to change the setting. Another interesting thing offered in the car is the under-armrest storage. The storage space which remains open partially, allows you to access your smartphone which can also be charged through USB port provided there. The storage can also absorb other small items together such as wallet, sunglasses, etc. Then there are door pockets at each door capable of holding 1 litre of bottle besides extra space for dumping items. Though the new A5 Sportsback is truly driver-focused, two passengers can also sit comfortably at the back. The rear passengers get rear aircons with 3-zone climate control as well. While there is adequate legroom at the back for two, the sloping roofline cuts the headroom which is not good for tall adults. On a positive side, there is humongous 480L of boot space which can absorb a lot of luggage if you are traveling with your friends and family. And adding to that convenience, the liftback featuring low loading lip height at 669mm, makes the heavy loading quite easy. From every angle the new A5 sedan looks charismatic. It’s not flashy but seriously elegant. The car is a low slung vehicle just like other cars in the class but with a touch of sportiness. As the vehicle is a fastback, the low-slung character can be seen when the roofline gracefully glides into the boot. There is a daunting aspect to the design as well and it starts from the front façade. The four creases on the hood look like they are swelling and thundering down into the grille that is slightly protruded. This lends the car a charging ahead stance. The aggressive look is further heightened with the headlights. The dual barrel LED headlamps features sharp and swept back DRL on the top. The side profile is where the real fastback character is evident. Apart from the sloping roofline, there are sharp body lines running through adding more to the muscular proportions. And while the chunkier looking boot features a thick and curvy lip, the smooth tail lights contains plethora of sharp edges which right to some extent balances the rear profile. The tail lamps features LED elements and also the party trick in the form of dynamic turn indicators which flows nicely in the direction of the turn. It looks fascinating, especially in the dark. Overall, the new A5 Sportback is a nice blend of sport and luxury. The exterior appeal is undoubtedly flamboyant. It makes sure that once you set your eyes on it, it makes hard for you take them off until and unless the car disappears from your sight. The diesel engine in this car is a fuel efficient one. The carmaker claims that A5 Sportback can deliver 19.2kms for a litre of fuel, however, in real world expect not more than 12kmpl. That isn’t bad either given the nature and character of the car. In terms of dynamism, one should not lose hope with this car. The A5 look and feel athletic and you can really expect some fun with it. But during high speed some might feel that it’s just a sedan donning a sportswear. The suspension system is tweaked slightly in favour of comfort and this factor makes the ride quality a little buoyant when it reaches around 110kmph mark. The car is especially floating on uneven patches on the surface. The tyres still remain planted however, the passenger can feel vertical movements and this is because of the lack of variable suspension in the car. Moreover, as this is the front-wheel drive vehicle and not a Quattro, it doesn’t urge you to take sharp and directional turn either. The steering wheel does add weight to the car when the driver switches to the Dynamic mode, but still it doesn’t improve dramatically and one would feel extra feedback is required from the tyres. But on the other hand, the manner in which this car gobbles up potholes is truly mind blowing. The A5 has been made to be a practical everyday car, so it behaves just like that. However, you do get a little jolt when going fast over an uneven patch, but despite the suspension setup is able to maintain composure very quick. The steering is light when Comfort and Auto modes are selected making the drive effortless in urban areas. The car offers good visibility and despite its proportions, it can fairly be managed in tight spots. Kick off the engine and the 2.0L diesel unit will grunt with a slight clatter. But soon after you move on, the rattling settles down while the vibration remain under control till the needle crosses 4500 rpm mark. The 4-cylinder in-line engine with common rail injection system and turbocharging technology is the same unit working under the hood of A6 sedan. And though presently there are even more refined engines in the market, this one still not disappoints when it comes to composure and noise & vibrations inside the cabin. The moment you put your foot on the accelerator, the car continues to drag you confidently until and unless you put your other foot on the brake pedal. The 190PS and 400Nm of torque can let the car feel spirited when pottering it in the cities. And that lively driving comes from the Comfort mode in which the throttle response is diluted a little and the gearbox tends to shift earlier. However, the Dynamic mode can fulfil the urgent demand of power to pounce ahead effortlessly. Move on to the open stretches and the car’s inherent nature comes into the picture. The engine when coupled to 7-speed S-tronic transmission helps the car breach 100kmph mark from naught in 7.9 seconds of time. The transmission quick and smooth and there are no complaints in this department too. But even with this, the engine doesn’t feel punchy and sporty and would definitely subject to split opinions. The feedback from the brakes is good and they are strong and linear as well. This efficiently helps in slowing down the car with confidence. The car also comes equipped with Anti-lock braking system with electronic brakeforce distribution, brake assist and autonomous emergency braking. Other safety aspects in the car include tyre pressure monitoring system, lane support system, cornering lights and traction control. What is the price of Audi A5? On road prices of Audi A5 in New Delhi starts from ₹ 54.02 Lakh for base variant Sportback, while the top spec variant Cabriolet costs at ₹ 67.51 Lakh. What are the colors options available in Audi A5?